Deployed as part of the revolutionary MineHop Wireless Network, this device acquires data wirelessly from up to 3 MDT SMART instruments. Also developed for deployment as part of the MineHop Wireless Network, this device logs data from up to 4 vibrating wire instruments and runs on batteries for up to 3 years. New for 2018, MDT has just released the SMART Link-BLT wireless module to make data collection even easier. The SMART Link – 485 is designed to take the standard analog signal from an MDT SMART instrument (MPBX, Cable, Contractometer) and convert it to a 16-bit digital RS-485 stream of data. The SMARTLog is a compact data logger designed for easy installation and monitoring. No need to run wires for power or communications; it runs on batteries for up to 18 months. 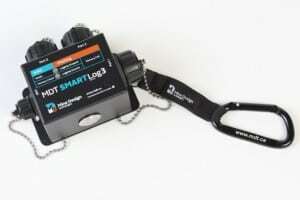 Based on the original SMARTLog, the new SMARTLog3 can now monitor up to 3 SMART instruments on a single box! Also, with increased resolution (16bit) and the same high quality you expect from MDT. The MDT SMARTReader is a small, rugged, easy to use readout unit for the SMART family of geotechnical instrumentation. The SloughReader is a small and rugged unit for displaying the status of the 10 anchors of a connected Slough Meter, indicating regions where ground failure has occurred. The SloughReader MC4LX2 V1.0 is a custom designed product based on a client request to read multiple sloughmeters in one location (up to 8 simultaneously).